Christmas shopping in Detroit was simpler in 1880 before department stores, mass merchandising, and the debut of Santa’s Grotto. J.L. Hudson Clotheier made its debut in 1881 inside the Detroit Opera House along Monroe Street, just east of Woodward Avenue, where today stands One Campus Martius. Prior to that, retailers consisted of dry goods stores that lined the main streets. Intrepid Detroit merchants undertook the 1880 Christmas season unaware they stood at a precipice. As in the past, they went about transforming their shops with window dressings and ornamentation, and added stocks of gloves, fur muffs, and mechanical toys made of metal. Even George C. Weatherbee & Co., producer of wooden and willow wares, counted on an increase in sales. Little did they know that, before long, feasting, small toys, a Yule log, and horse racing on the snowy streets and frozen Detroit River would succumb to gift-giving English style (although the Victorians were to hold off introducing Santa’s Grotto a few more years). Detroiters wishing to exchange “pretty little tokens of goodwill and kindly thoughts,” as one English contemporary wrote, would strike out for Woodward Avenue, where the dry goods establishments were congregated. 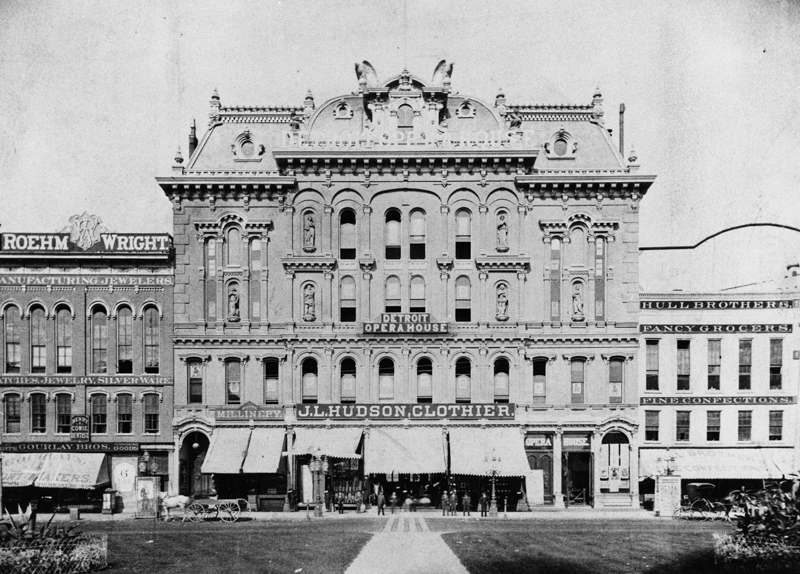 In 1880, William Elliott ended his partnership with George Peck and Co. and opened his own store at 139 Woodward Ave. “He has adhered strictly to a cash business and to the one-price rule, and has never been sensational in his advertisements or methods,” his contemporary, Silas Farmer, wrote. Farmer also noted the success of Newcomb, Endicott, and Co., which occupied a new building put up by seed baron D.M. Ferry. “As an indication of the extent of their business, it may be mentioned that of kid gloves alone, although they are not a distinct specialty, their sales have reached as high as $40,000 in a single year,” Farmer wrote. In that era before toasty synthetic parkas, furs were in demand. The raw furs that were made into wearable items came from Henry A. Newland and Co. Partnering with Frederick Buhl, Newland traveled to European fur sales and developed his expertise. His own fur business, also opened in 1880, grew larger than any west of New York. The proprietor was “one of the most enterprising and successful of the businessmen of Detroit,” according to Farmer. Furniture also proved to be a favored gift. Located along Jefferson Avenue, Dudley and Fowle boasted of its inventory: “No old moth-eaten stock, bought in job lots, out of style, shop worn, with moths thrown in.” This pitch must have worked. D&F’s “warerooms consist of 17 floors, each 80 by 100 square feet in dimension, and their sales amount to nearly a quarter of a million dollars annually,” Farmer said. In case anyone deserved a lump of coal, Osias Shipman, Michigan’s go-to coal guy — who disposed of “600,000 to 700,000 tons yearly” to the railroads — might have been able to spare it. Meanwhile, at the Russell House (today the lot is occupied by the First National Building), the hotel’s orchestra practiced carols while the chef planned a menu with chestnut-stuffed turkey, sweet potatoes, and Christmas pudding of molasses and suet. Time seemed to be standing still. All of it soon became quaint, though, and department store merchandising knocked out the Woodward dry goods stores in a few years. Hudson’s grew humongous. Selfridge added a twist when he moved to London in 1909, founding his fine store on the idea of shopping for pleasure. The era of mass merchandising was rolling; in a few more decades, it would meet the internet.